The Gorkha Janmukti Morcha’s Binay Tamang camp on Tuesday said the general election was a fight for “self-dignity and identity” of the Gorkhas and it was time to rise above politics of emotion. Anit Thapa, the general secretary of the Morcha (Binay), was addressing a worker’s meeting at Lebong on Tuesday. “Nearly 90 per cent of our hill people are landless; they do not have land rights. We do not have our own land but leaders used the Gorkhaland slogan to stir our emotions without actually delivering anything for us,” he said. The Morcha leader stressed that it was time for the hill people to engage in politics of reality. “We need to be practical. We need to deliver something concrete. We must rise above politics of emotions and use our head instead of our heart,” said Thapa. “We must not let our leaders play with our emotions or else, our future is doomed. This time, the vote is for our self-dignity and identity,” said Thapa. Morcha leaders, including Binay Tamang and Thapa, repeatedly referred to chief minister Mamata Banerjee’s January 23 speech at Chowrasta in Darjeeling where she had broached the identity issue of Gorkhas. Binay Tamang has been maintaining that one of the major hurdles to the identity of Indian Gorkhas is Clause VII of Indo-Nepal Friendship Treaty, 1950.The clause allows for free movement of citizens in each other’s territory. Amar Singh Rai, the candidate of the Morcha (Tamang)-Trinamul Congress alliance, said he, too, felt sad when he reflected on the past agitation. “I feel sad when reflecting on those days. Everyday, I used to be on the ground, people would be on the ground. But in the evening, it was almost my daily routine to be at the police station because I would get calls that some people have been arrested,” said Rai. “Innocent people were pushed to the brink,” said Rai. Rai said he had always done his job with all seriousness. “I am a worker and I have done all work entrusted to me with dedication. I think while in the GTA (as a member of board of administration), I tried to fulfil my responsibilities,” said Rai. Tamang said in the past one year, the jobs of more than 1100 teachers had been regularised. “During the agitation, the leader (referring to Bimal Gurung) urged people to take to the streets and engage in violence while he always remained safe. Has any leader’s family member become a martyr?” asked Tamang. 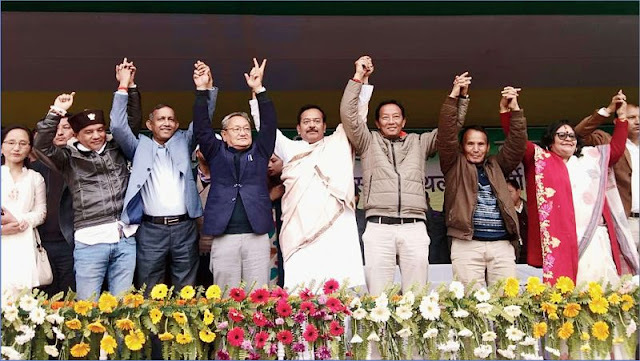 Ministers and Trinamul leaders Aroop Biswas and Gautam Deb also addressed the gathering at Lebong.